Uzbekistan’s flagship air carrier Uzbekistan Airways has taken delivery of its third Boeing 787-8. 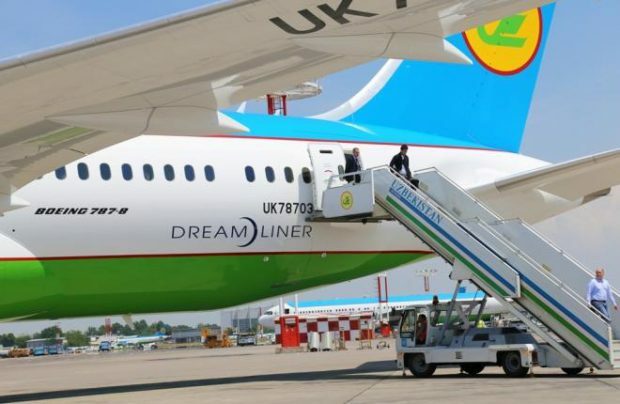 Sporting tail number UK78703, the aircraft operated its first commercial flight from Tashkent to Moscow on May 20 with 244 passengers on board, the airline reports. The latest addition provides 270 seats – 24 in business and 246 in economy class – compared with the 246-seat first two Dreamliners in Uzbekistan Airways’s fleet, and also features a crew rest compartment. All three aircraft are powered by GE Aviation Genx-1В engines. Uzbekistan Airways initiated commercial operations of the type in September 2016 and now, with the aircraft operating flights to Dubai, Istanbul, Tel Aviv, Seoul, Frankfurt, Moscow, Kuala Lumpur, Singapore and New York, the airline is claiming 100 per cent dispatch reliability of its Dreamliners. The plan is to have at least six B787s in its fleet by 2020. After abandoning the operation of its fleet of Ilyushin IL-114-100, Russian/Soviet-made turboprops on May 1 this year, Uzbekistan Airways is now a western-built-only jet operator. It currently flies 22 passenger airliners, including three Boeing 787-8s, six Boeing 767-300ERs, four Boeing 757-200s and nine Airbus A320s. Four more aircraft – a Boeing 757 and three Avro RJ85s, which are also registered with the airline – are, apparently, grounded. The national carrier also operates two Boeing 767-300F freighters and two VIP-configured aircraft, a B767-300ER and an A320, for the transportation of the country’s high-ranking officials. Last year the airline carried 2.7 million passengers, exceeding its 2016 results by 9.4 per cent.